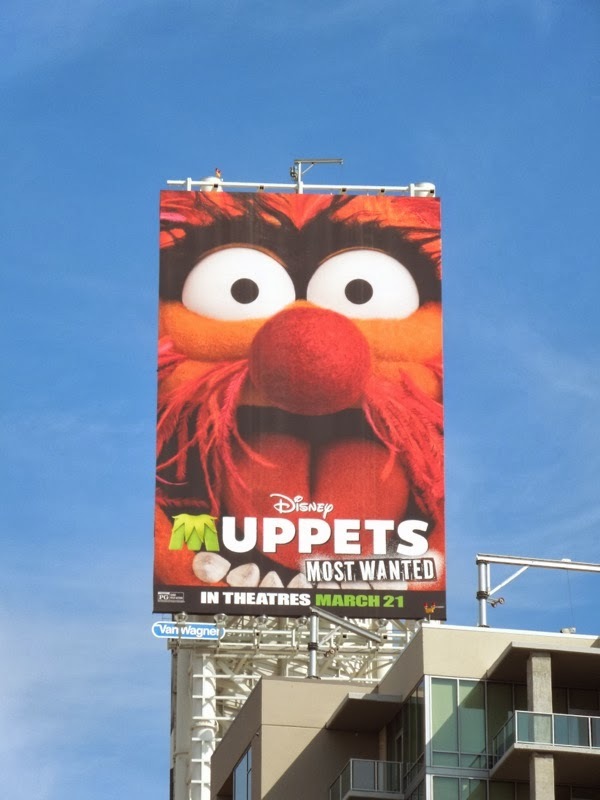 The question on everyone's lips is, will Muppets Most Wanted high kick its way to the top of the box office after its 2011 big screen Oscar-winning revival. If 'Miss Piggy' has anything to say about it they will. 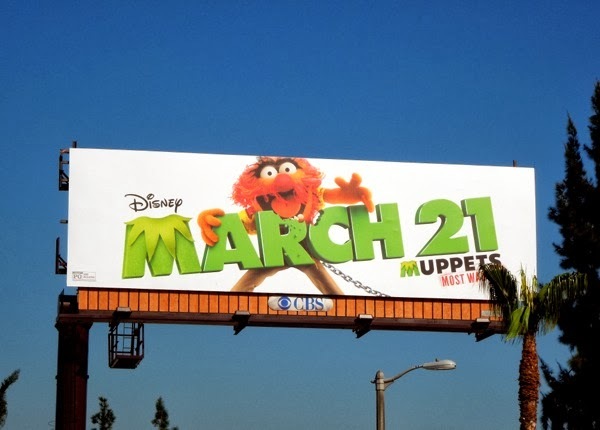 With the help of Amy Adams, Jason Segel and new Muppet character 'Walter', the world's biggest Muppet fan, Jim Henson's lovable creations won accolades and adoration galore, including the Academy Award for Best Original Song, 'Man or Mupppet', by Bret McKenzie, for their seventh feature film. 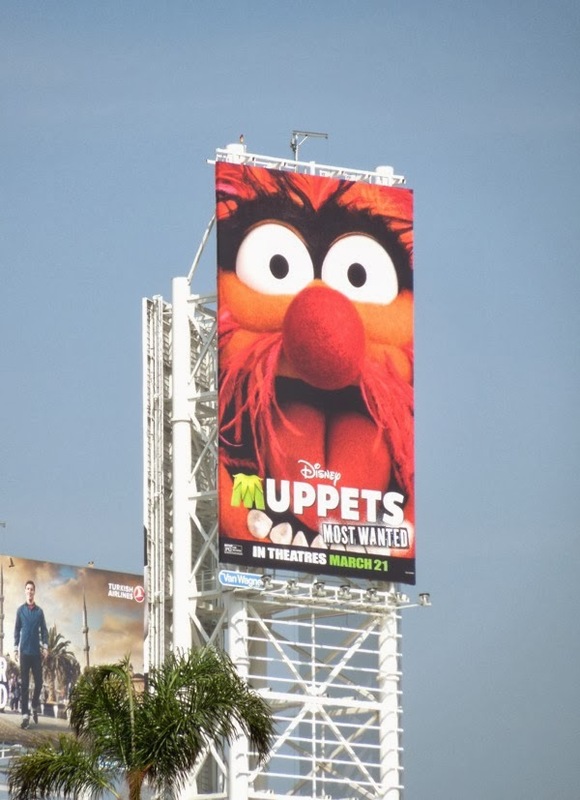 Now after reestablishing themselves in cinema goers minds, familiar faces 'Kermit', 'Miss Piggy', 'Animal' and 'Fozzie Bear' are back in their own unique way to tempt you back to theaters to watch their new international crime caper, Muppets Most Wanted. 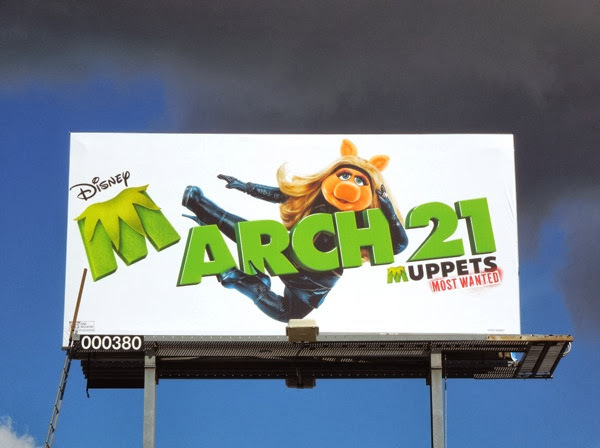 Whilst the 2011 movie used the fresh face of Walter to reintroduce us to the world of The Muppets, this time around Disney are obviously counting on audiences love for the instantly recognisable faces of these particular characters to get butts back on seats. 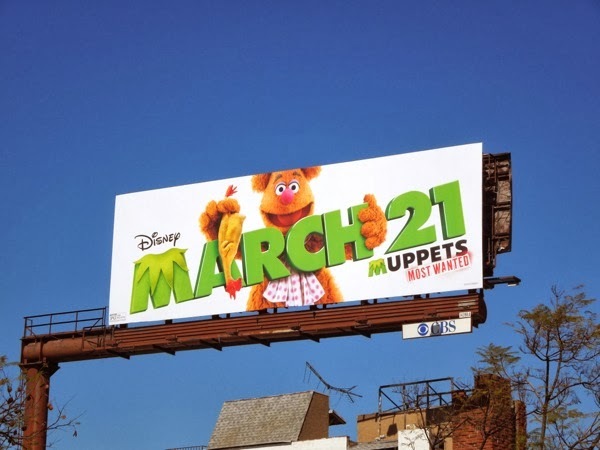 They're so confident with the strength of the Muppets franchise, first made famous with their 70's variety-sketch TV show, that the film's title is secondary to the movie's release date in this ad campaign (although Kermit's signature frog neck collar immediately screams Muppets, even if he's not featured). This time around the gang are joined by the likes of Ty Burrell, Tina Fey and Ricky Gervais to help keep the laughs coming, as a Kermit the Frog lookalike, the world's top criminal 'Constantine', causes all kinds of trouble when the Muppets are on their global tour. If you loved Miss Piggy in all her ninja kick-assery in the 2011 movie, be sure to take a look at Miss Piggy's couture collection costumes from The Muppets, plus check out Ty Burrell's Interpol inspector costume and tiny car from Muppets Most Wanted on display. 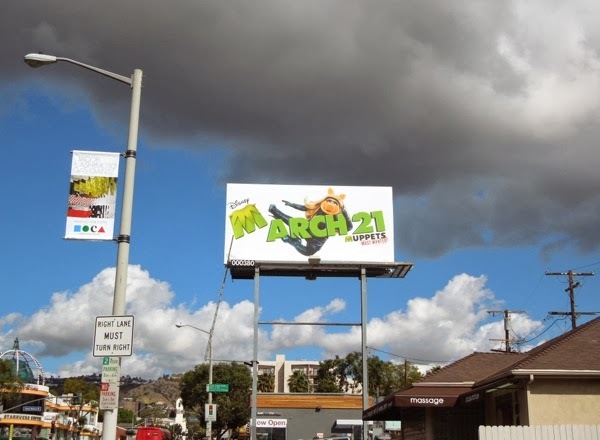 This billboard featuring Animal, the crazy drummer from 'Dr. 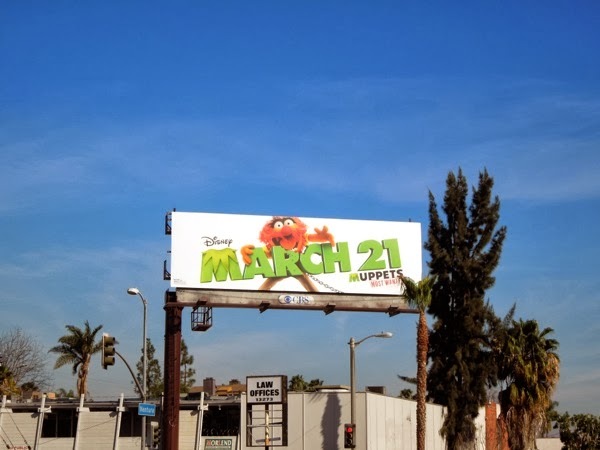 Teeth and the Electric Mayhem' Muppet band, was first spied along Ventura Boulevard in Studio City on January 29, whilst the ad creative with the close-up of his face was spotted high over Sunset & Vine on March 5, 2014. 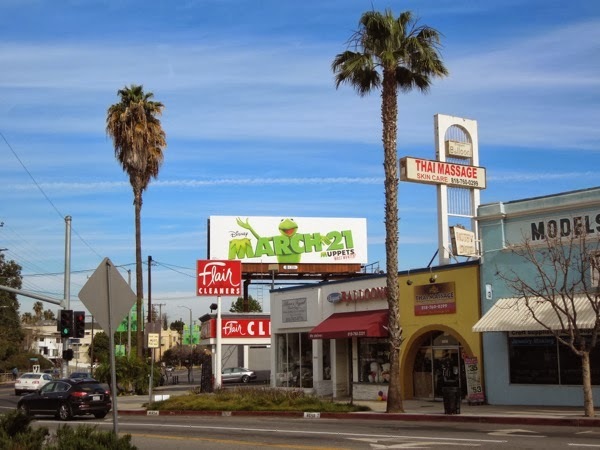 The fun Miss Piggy billboard was spied along Fairfax Avenue on February 27, with the Fozzie Bear version (complete with rubber chicken) was snapped along Santa Monica Boulevard in West L.A. on March 10, 2014 and the Kermit creative a day later along Laurel Canyon Boulevard in Studio City. 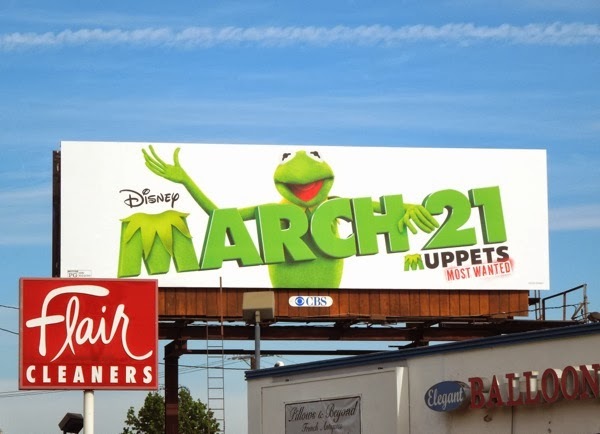 Plus if you like these ad creatives, be sure to take a look at The Muppets movie billboard campaign from around L.A. and New York City in 2011. Now if only 'Dr. 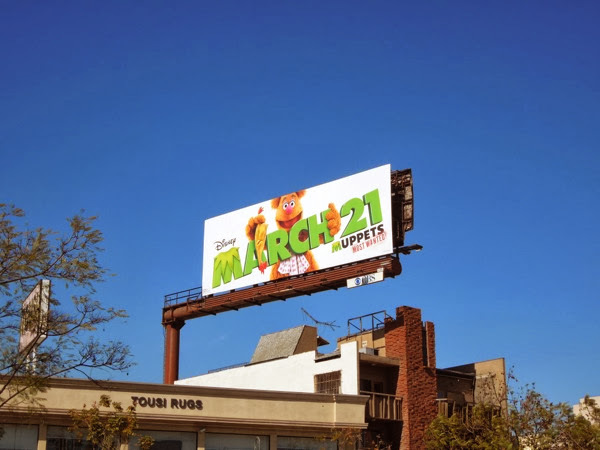 Bunsen Honeydew's' long-suffering science lab assistant, 'Beaker', had his own billboard, as he's Daily Billboard's favourite Muppet. UPDATED: If you're a true Muppets fan, be sure to also check out Miss Piggy's wedding dress from Muppets Most Wanted designed by Vivienne Westwood on display.